Papago Park Village condo community can be found at the intersection of East Curry Rd and North College Ave, at 925 North College Ave in Tempe, Arizona, 85281 in Maricopa County (scroll to bottom of page for Google Map). Adjacent to Scottsdale Rd, Papago Park Village is tucked in along the quiet natural settings of the foothills of Papago Park, yet is centrally located just minutes from the major highway systems, 202 and 101, in close proximity to the Phoenix Sky Harbor International Airport, nearby lively entertainment, shopping and business districts of Mill Avenue Downtown, Tempe Marketplace, Old Town Scottsdale and Mesa Riverview, Casino Arizona, Talking Stick Resort, Fashion Square and of course Tempe’s major University, Arizona State University (ASU). Perhaps you’re considering living in one of the 216 individual units, including 3 bedroom, 2 bedroom or 1 bedroom condos, ranging from 1,444 sq. ft-864 sq. ft and are interested in learning about available Papago Park Village condos for rent? Or maybe you are a prospective property owner and you are looking for Papago Park Village condos for sale? Did you know: Papago Park Village is one of the only condo complexes within short walking distance to Tempe Town Lake with individual condo units available as both rentals or to own. and while enjoying the next-door Papago dog park. Each of these enjoyable outdoor amenities are within a few minutes drive or walk from the Papago Park Village condos in Tempe. 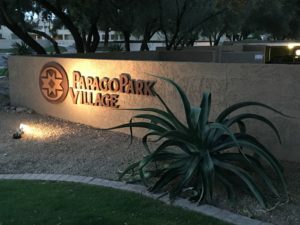 After becoming aware of this beautiful, centrally-located community, the next step in learning about Papago Park Village often times involves a Google or Bing search to find the condo complex website. or, Papago Park Apartments, a pet-friendly, 134 unit apartment complex located at 5350 East Taylor Street, Phoenix, AZ 85008. Only current Papago Park Village homeowners and residents are able to access documents and obtain community details, via the homeowner’s association website First Service Residential secure portal. Therefore, the goal of this website is to provide information about Papago Park Village condominium that does not exist in any other public access website on the Internet. 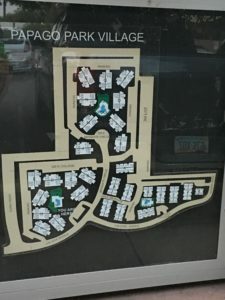 One of the main reasons for a lack of helpful information is because, unlike many large apartment complexes in the local area – such as Papago Park Apartments – Papago Park Village does not have a central leasing office. Each condo unit is thereby maintained by an individual property owner. It is the responsibility of the homeowner to let the public know that their unit is available for rent or to own. Most vacant condo units available as rentals or to buy are handled by a property management company or through a local real estate agent. Property owners can, of course decide to rent and post their listing on popular rental websites (including Craigslist) or offer their unit available for sale by owner. There is not a single physical location where a potential tenant or prospective homeowner could visit to request and obtain more information about Papago Park Village Tempe rentals. How many condo units are there available for rent or for sale in Papago Park Village? Trac A, located on the loop of 925 N. College Ave., consists of building 9 buildings: A, B, C, D, E, F, G, H and I.
Trac B, on the loop of 700 E. Mesquite Circle, includes 9 buildings: J, K, L, M, N, O, P, Q and R.
Trac C, which is located on the loop of 609 E. Mesquite Circle, consists of 11 buildings: A, B, C, D, E, F, G, H, I, J and K.
Trac B and C, also feature an RV parking lot. Trac A, B and C, each include a pool. Each unit has an alpha-numeric address, consisting of one letter and a 3-digit number to identify their place of residence. Condos become available to rent or to own throughout the year. However, it is against Papago Park Village policy to lease any single unit for less than 30 days. How many bedrooms are available in each condo unit of Papago Park Village? The largest units consist of 3 bedrooms, a main area, a kitchen, laundry room, a dining room and come equipped with 2 full bathrooms. These units have a downstairs and upstairs level. The square footage is approximately 1,400 sq. ft. The single bedroom condos feature one bedroom, a main area, a dining room, laundry room, kitchen and one full bathroom. Square footage measure roughly 864 sq. ft.
What are typical rental rates at Papago Park Village? There is not one set rate for rentals since each homeowner (or property management company / real estate agent working on behalf of a homeowner) creates their own rent rate for their individual condo unit. It is common to find monthly rent ranging from $800-$1,500, depending on the size of the unit, whether it is a 3 bedroom, 2 bedroom or 1 bedroom condo. This is just an estimated range, as the pricing of each rental unique is set by the homeowner and will vary from unit to unit. Due to the recent $700 million, 60,000 sq. ft development of the Marina Heights business complex on Tempe Town Lake, however, rent rates in the area are sure to rise as real estate values surge. Are there community pools at Papago Park Village and if so, how many? Yes, there are three pools within the community. Each pool is maintained by a professional pool service, so they are clean and functional. People using the pool do so at their own risk. No unsupervised children under the age of 12 are permitted to use the pool area. Glass and other breakable items not permitted in the pool area. Animals are not allowed in the pool, or within the gated area of the pool, at any time. How many parking spaces are granted per condo unit? One covered parking space under the carport, plus one uncovered assigned parking space for a total of two per unit. Be aware – if an unauthorized vehicle is parked in an assigned parking spot, the resident of that unit has the right to call the towing company and have the vehicle towed at the vehicle owners expense. Look for uncovered guest parking spaces available for any vehicle to utilize. In total, there are 450 parking spaces in the condominium complex, including an RV storage lot. Is Papago Park Village a pet-friendly condo complex? Of course! Resident’s of the community love their pets. It is, however, up to the policies of each homeowner, as to whether or not they will allow a tenant to keep dogs, cats or any animals in their unit. According to community policy, no more than two pets are allowed per unit at any time. Always remember that if you have a pet, it is community policy – and Tempe city ordinance – to pick up after your fury friend! You can be fined up to $120, if someone reports having witnessed you not picking up after your pet. Understandably, no one else should have to deal with your pet’s waste. The Papago Park dog park, off Curry Rd and College Ave, is located right across the street from the condo community and can be accessed free of charge! Is there a tennis court, gym, playground or clubhouse for community access? No, these amenities are not available within the condominium grounds. However, Papago Park Village is centrally located within the East Valley and makes for a quick access point to hiking and biking trails, nearby gyms along Scottsdale Rd. Is there an HOA and a Board of Directors who maintain the community and address any concerns of the Papago Park Village residents? Yes, there is both a Home Owners Association (HOA) and a Board of Directors for the community. Since there are over 200 units, and presumably several hundred residents, and no leasing office, it is very necessary that some oversight is maintained by an HOA. In the case of Papago Park Village, the HOA is First Service Residential. All residents, tenants and property owners may direct all communication to the Community Manager, through First Service Residential’s contact number, which is 480-551-4300. The role of the Board is to collect monthly HOA fees from the individual property owners and determine the most fiscally responsible way to maintain proper conditions of the community. The Board of Directors consists of several individuals who are elected on a yearly-term by a majority vote from the individual unit property owners. Any Papago Park Village property owner may run for a position on the Board of Directors. Currently there are three Board Members along with the Community Manager through 2019, whom meet every third Wednesday of the month. Homeowners are welcome to attend open board meetings are held at: 9000 E Pima Center Pkwy, Suite 300, Scottsdale, AZ. Condo homeowner’s associations takes care of the “big-picture” initiatives including exterior painting of the condominium, carports and hiring professional service companies to oversee the electrical, plumbing, pool, landscaping and grounds maintenance of anything outside of the individual units. It is the homeowner’s responsibilities to attend to any issues pertaining to the space within the walls of the condo unit. Contact your landlord or property management company with any concerns regarding the plumbing, electrical, utilities, appliances, etc in your condo unit. What are the residents like and is Papago Park Village a nice place to live? The Papago Park Village residents are a mix of working professionals, ASU students, graduate students and professors, retired folks and small families. Residents seem to live with respect to one another and maintain clean, safe living spaces. If you stroll through the area, you will hardly ever hear excessive noise or partying. Most often, residents seem to keep to themselves and enjoy their individual living space. It’s very common to see residents out and about, walking their dog throughout the community or to the local dog park or enjoying one of the three outdoor pools. Papago Park Village is truly a hidden gem. Again, because it is not a large apartment complex equipped with a fully staffed leasing office and marketing department, many folks in the Phoenix area aren’t even aware of it’s existence. However, with its diverse mix of residents and its central location to entertainment districts, major highway systems, in contrast to the easy-access, peaceful, natural settings just minutes from the condominium, including miles of hiking trails and walking paths leading to Tempe Town Lake and beyond, Papago Park Village in Tempe won’t stay the best kept secret in condo living for long. Leave a review of your Papago Park Village experience on Facebook!